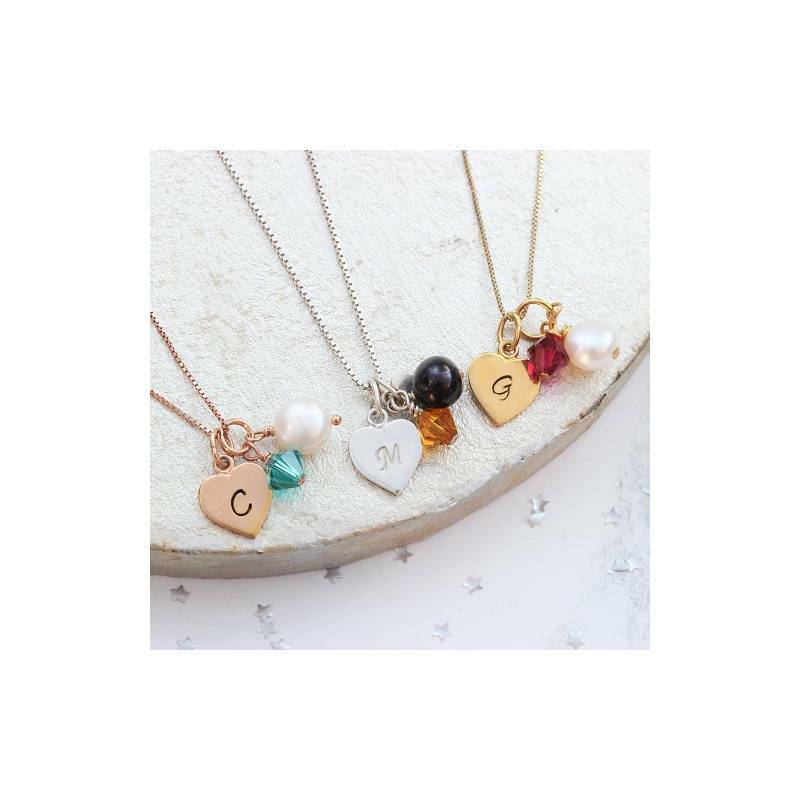 Celebrate your love of handmade jewellery with this Personalised Birthstone Swarovski Charm Necklace. 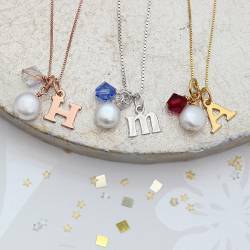 The perfect gift for birthdays and a popular keepsake for bridal parties, it is handcrafted to order in your choice of silver, yellow gold or rose gold vermeil, equipped with a classic clasp fastener for easy dressing, and presented with three gorgeous trinkets. 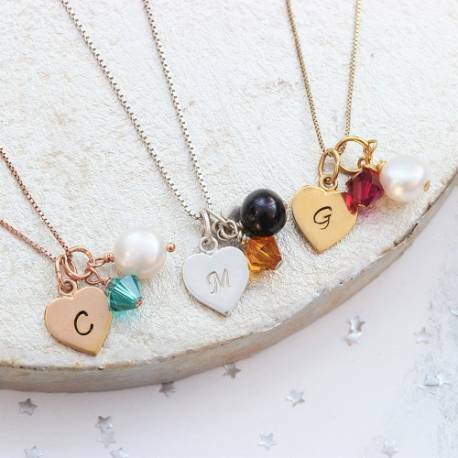 A heart shaped charm inscribed with the initial of your choice adds a touch of romance to this gorgeous Pendant Necklace, while the shimmering freshwater pearl, available in black or white, adds natural radiance. Finally, a genuine Swarovski crystal in the birthstone colour of your choice lends sophisticated sparkle to this delightful piece of jewellery. Each letter is hand stamped and patinised (black finish) so it stands out, or we can leave it silver or clean (clean fnish). The font used is upper case calligraphy and the letters are approx 3mm high. We can stamp one initial onto the front of the heart. It is complemented by a Swarovski crystal and pearl cluster. You can select the colour of the Swarovski crystal that represents their birthstone. There is always more than one birthstone per month so if you don't like the one we have chosen please email us for alternatives. The crystal and pearl cluster is separate from the heart. They can both be removed from the chain so you can wear just the heart on its own, or just the cluster on its own or both together. Additional hearts and charms can be purchased separately under the charms section. Your necklace will be beautifully gift wrapped in a matt black box, tied with ivory satin ribbon and a birthstone gift card enclosed. This standard service is completely free of charge. The box chains are available in 4 lengths: 14"/35cm (young childs), 16"/40cm, 18"/45cm and 20"/50cm.